Neptunia series character designer, Tsunako, and producer, Naoko Mizuno are official Guests of Honor at Anime Expo, this July 1-4! Planning your AX trip? 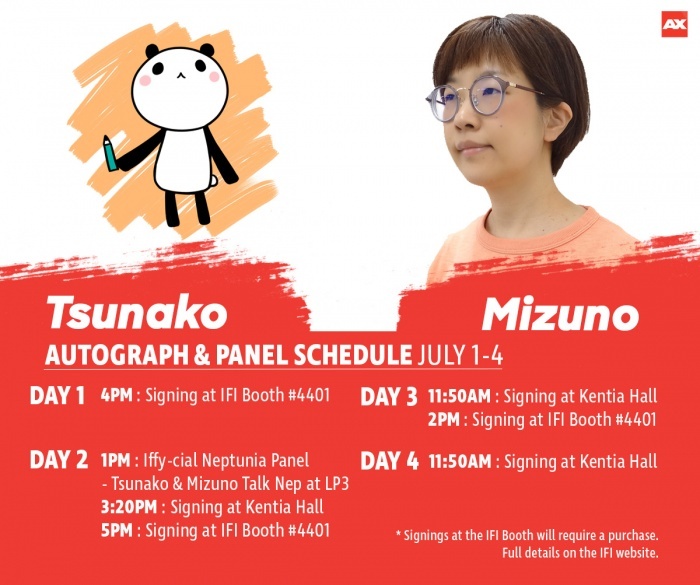 Catch them at the following autograph appearances and at the Iffy-cial Neptunia Panel! We’ve got a special surprise prepared for Neptunia fans there! * Purchase $35 or more from the IFI booth on any day for one autograph ticket. Purchase $80 or more for two autograph tickets. That ticket may only be used for an IFI Booth signing on the same day. - You are responsible for providing your own item to be signed. We will be selling autograph cards and posters at booth #4401 in the exhibit hall! - They are unable to accept any baked or homemade food items as gifts. - NO photography is allowed. - Please arrive 15 min before the autograph session. - Please be considerate of others in line and keep your time with the guest short.